Mark Seymour was born in Benalla and grew up in country Victoria. His family was musical. Paula, his mother, encouraged all her children to sing and play musical instruments. Mark learned classical piano for a time, but found the technical discipline a little challenging and soon moved onto guitar in his early adolescence. The family moved to Melbourne in 1972. Life in the outer suburbs was, as many of us well know, excruciatingly boring, and though Mark was a conscientious student, he found that there was simply not enough to do, particularly as his family were deeply religious Catholics. For Mark, adolescence was dead time. The brakes were on and stayed that way pretty much until he graduated from Melbourne Uni in 1978 and became a schoolteacher two years later. At that time he realised, in a rare moment of clarity, that his life was going the wrong way entirely and that drastic action was required. Towards the end of his formal education he began going out to pubs to watch rock bands. Around the turn of the decade in Melbourne, there were bands aplenty in Melbourne and Mark became hooked on volume and cold beer. Mark formed Hunters and Collectors in 1980, with a bunch of Uni friends. It was a rollicking eight-piece funk ensemble with industrial percussion, ” bizarre” atonal synthesizer, thundering bass guitar and a brass section that was so demonically loud that it became known as the ” Horns of Contempt “. In it’s early form Hunters and Collectors was less like a band, and more like a monstrous ” jam session” loosely tied to melody and words, which Mark provided, when he was audible. At times there were as many as fifty souls on stage as audience members joined the parade. Instruments were frequently stolen. However, all was not chaos. The band became famous for its rhythmic power and very quickly became touted as the ” next big thing” which is an Australian euphemism for a poppy that grows too fast, which Hunters and Collectors truly was. The Album ” Human Frailty ” was recorded in Melbourne in 1985. This record has proven to be one of the most important and enduring records of the eighties and Hunters and Collectors were still playing a large part of this cut in 1998 when they retired. With ” Human Frailty ” Mark discovered, love, loss, and pop melody. His solo records are directly connected to this era and bear the same stamp of raw honesty and emotional power. By 1998, Mark felt that he had done all that he could as the front man of Hunters and Collectors. In that year he plunged into the unknown. After eighteen years of touring with what became one of Australia’s most successful and deeply loved rock bands, he found himself alone on stage with just an acoustic guitar. In going solo Mark has discovered a new and refreshing intensity in h is voice that he believed he had lost in the band. is work has developed and grown around this simple and direct approach to performing. He continues to search for the emotional truth in a song. Mark Seymour’s strength as a performer remains undiminished despite the ever-present shadow of the band he used to be in. 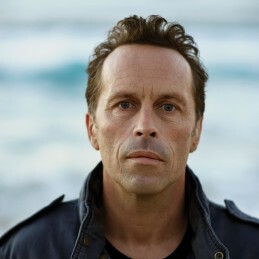 Now in 2011, Mark takes this theme and tone further with his new self titled album Mark Seymour and the undertow. A collection of songs with an emphasis on storytelling it is both raw and intense with Mark’s vocals adding darkness, poignancy and drama. Musically it’s an album of roots based blues with a touch of country and folk, performed and collaborated with Mark’s regular band mates ‘ The Undertow ‘ comprising Peter Maslen ( drums ), John Favaro ( bass ) and Cameron McKenzie ( Guitar and also co-producer ). Mark Seymour lives quietly (sometimes) with his wife Jo and their two beautiful daughters Eva and Hannah, somewhere on the Australian coast.